Perceived threats to “national security” make politicians and pundits say stupid things, especially aboutÂ privacy rights. There’s just no other way to put it.Â Open almost any informationÂ source, or Fox “news” if you must, at almost any time of the day for plenty of examples. Following the recent events in Paris, cameÂ another round of those stupid things, including callsÂ to ban communications tools that don’t allow governments to have “backdoor” access to every bit of information sent, including this one from the British Prime Minister. He said: “In our country, do we want to allow a means of communication between people which […] we cannot read?” He made the connection between encrypted communications tools and letters and phone conversations, both of which can be read by security services in extreme situations and with a warrant from the home secretary.2I love that someone from an opposition party in the UK said that the Prime Minister is “living in cloud cuckoo land”. 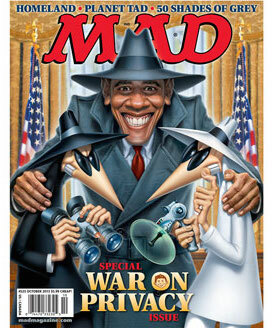 We have plenty of high profile peopleÂ in this country who alsoÂ want the government to haveÂ thatÂ backdoor as a tool to keep us “safe” from bad guys. Even though the NSA, our ownÂ literal “big brother”, is alreadyÂ hoovering up every bit of communications data they can find. However, as Cory Doctorow, the EFF and many other smart people have pointed out, “backdoors” won’t just be used forÂ honest law enforcement. What David Cameron thinks he’s saying is, “We will command all the software creators we can reach to introduce back-doors into their tools for us.” There are enormous problems with this: there’s no back door that only lets good guys go through it. If your Whatsapp or Google Hangouts has a deliberately introduced flaw in it, then foreign spies, criminals, crooked police (like those who fed sensitive information to the tabloids who were implicated in the hacking scandal — and like the high-level police who secretly worked for organised crime for years), and criminals will eventually discover this vulnerability. They — and not just the security services — will be able to use it to intercept all of our communications. That includes things like the pictures of your kids in your bath that you send to your parents to the trade secrets you send to your co-workers. Plus, as DoctorowÂ also points our, similar requirements and technological solutionsÂ haven’t worked in much more restrictive countries like Russia, Iran, and Syria. Ok, I’m no security expert, although I do have a good basic understanding of the technology involved. This is simply the rant of someone who is tired of being told by an assortment of largely untrustworthy figures that we must give up rights, Constitutional and other, for an uncertain and vaguely definedÂ promise of “security”. It all seems like a very unbalanced compromise. The new assistant superintendent for our department here in the overly-large school district says he wants to improve communications both within the organization and with his office. To that end, a couple of months ago he started writing a weekly email message to all of us. Lots of text, one-way message. This week his efforts took several steps even farther backwards when his message showed up as a PDF newsletter-formatted attachment. We continue preaching “21st century” skills for kids while modeling methods from the 20th. Predictions of what will happen next year should be viewed with great suspicion. Those dealing with what will happen in the next five years are pretty much worthless. However, these four big predictions about the web’s near term future I think fall into the no-duh category. It’s pretty clear that many of us want to be connected, at high speeds, from anywhere we go. Those numbers will only grow and the infrastructure to do it is rapidly expanding as well. Certainly not around those devices that we currently identify as “computers”. Is that a prediction or a statement of current reality? Again, a trend that is well underway. I wonder when (or if) these trends (you can’t really call any of them “predictions”) will significantly affect schools and the American education process. After all, none of them fits particularly well with the traditional teacher-directed educational structure we continue to cling to. When it comes to using the web, schools work hard to control the times, locations, and circumstances under which access will be allowed, at least for the vast majority of the people involved in the learning process (ie. students). In most schools and districts, we insist that the equipment used by teachers and students look like a “normal” computer, often locking them up in formal “lab” settings or slightly less formal “mobile labs”. And, of course, the media used in most classrooms is still overwhelmingly text-based (even when using screens) and we actively discourage anything that looks like social media. So, is the American education system immune (or just oblivious) to these major shifts in the way the world outside communicates and uses information? How long can we prevent the future (or the present for that matter) from leaking into our classrooms? 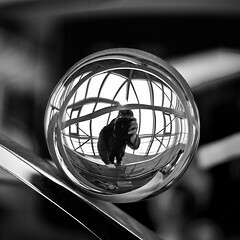 Picture: me, myself and I – in a crystal ball by Michal Kolodziejski. Used under a Creative Commons license.